Asus is renowned for producing a wide range of high-quality machines at all price points, with its K701O-TY014V proving a great choice for those after an entry-level multimedia laptop. To be clear from the outset, this isn't a machine for frequent travel use. The laptop weighs 3.3kg and we squeezed just 145 minutes from the battery. Those after a laptop for the commute into work or school would do better to check out the Samsung X420. Criticising the Asus too strongly for this would be counter-productive, however, as it's primarily designed as a large and comfortable desktop replacement system. It is a very comfortable laptop to use. 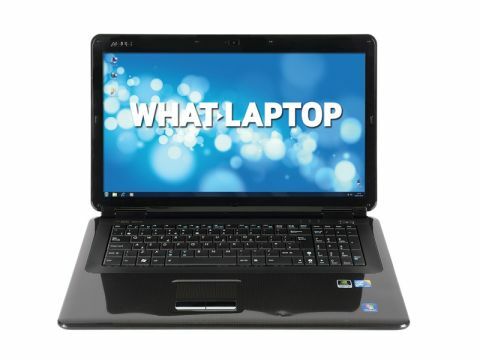 The 17.3-inch screen is bright and provides an absorbing experience for watching DVDs on. It boasts a 1600x900 pixel resolution, which means that images are very detailed, while colour and contrast also impress. The very spacious keyboard exhibits quite a bit of flex, but you're unlikely to notice it unless you have a very firm typing action. A dedicated numeric keypad is included, which is great for left-handed gamers, while the touchpad has a comfortable mottled texture. The use of an ageing Intel Core 2 Duo T6500 processor can't provide the cutting-edge performance of the Sony Vaio VPC-EB1S0E/WI and Packard Bell EasyNote TM86's Core i3 chips, but there's plenty of power for running office applications, meaning you'll have no problem browsing the internet and word processing. This laptop features a powerful Nvidia GeForce GT 120M graphics card, helped along by a group-leading 1024MB of dedicated video memory. This means editing your family photos won't be a problem. In fact, you'll have no problem running the latest games, although you'll have to turn the graphical settings down a little, making this laptop the only option in this group for gamers. The 320GB hard drive provides plenty of storage space for all your files, folders and multimedia libraries, while the DVD rewriter optical drive offers you an alternative back-up solution if you don't want to use an external hard drive to backup your data. The laptop doesn't feature an eSATA port, which the majority of new machines now do, but an HDMI out port allows you to connect your laptop to a high-definition (HD) external display, such as your TV or projector, to show off your photos or even play games on the big screen. Overall, we enjoyed our time with the K701O-TY014V a lot. It isn't as powerful as some of its rivals when it comes to everyday use, but it's very comfortable to use and provides more graphical punch than most other laptops at this price.